One arrest and conviction from Occupy Wall Street exposes the flaws of safety as surveillance. There has never been a time when humans were more invested in documenting things. Over the last twenty years, cameras have been put in telephones, elevators, traffic lights, bicycle helmets, and Xboxes. The public welcomed this proliferation; it arrived like a gift of modernity, allowing people to create their own sentimental mementos on command. And beneath this indulgence, there is the fundamental belief that photography reveals truth. It relieves us from the burden of memory by producing an impartial image from the past, which allows us to see what we want to see without having to acknowledge our desire’s presence in the composition of the image. Earlier this month, my friend Cecily McMillan was convicted of second-degree assault of a police officer after a month-long jury trial, in which the prosecution’s case depended on a 53-second excerpt from a livestream video taken at a police raid of Occupy Wall Street’s six-month anniversary demonstration in Zuccotti Park. The video was uploaded to YouTube by an unknown user and then ripped by the District Attorney’s office using third-party software to circumvent the website’s prohibition on downloads. The clip was encoded at a resolution of 640x360 pixels per inch, with the incident occurring in the bottom corner, accounting for roughly 5 percent of the entire frame. She remembered feeling pulled back and up, and then being slammed to the ground. She has little memory of anything else until waking up handcuffed to a hospital bed in police custody later that night, where she was told she was under arrest for assaulting a police officer. According to the prosecution, this video showed Cecily willfully crouching down and then launching herself upward to strike Officer Grantley Bovell, who testified that he was escorting her out of the park in order to clear it for cleaning, one hand placed authoritatively on her shoulder. Cecily testified she had never seen or spoken to Bovell and was leaving the park on her own, intending to continue a night of St. Patrick’s Day celebrating she’d begun earlier that evening with a friend from out of town, when she felt a forceful jerk on her right breast. She remembered being pulled back and up, and then being slammed to the ground. She has little memory of anything else until waking up handcuffed to a hospital bed in police custody later that night, where she was told she was under arrest for assaulting a police officer. For the defense, the video showed Cecily’s legs buckling and knock-kneed, not in a posture of strength but in reaction to a burdensome force applied from behind. Beneath her right arm is black mass that appears to be Bovell’s arm pulling sharply across her torso and breast, drawing her arm upward along with it. The prosecution contends this black mass is the shadow of Cecily’s own arm, which if true would mean her head should also have cast a shadow across her chest. No other shadows are visible in the image. The prosecution presented this video in a number of different formats during the course of the trial: played at normal speed, played in slow motion, played in a cropped version to zoom in on the interaction between McMillan and Bovell, played back with a halo of brightened color correction surrounding the two to compensate for the poor quality of the video. Dozens of individual frames were isolated from the video and presented in PowerPoint slideshow, while prosecutors told and retold their story. Like digital photos, digital video is composed of individual pixels, each of which is given a color value based on the camera’s translation of light hitting its sensor into computer code. At low resolutions, like the 360p file played in court, a relatively small number of these colored squares are used to compose the image, which results in the indistinct mosaic of colored squares. The cropped version of the video shows the limits of the resolution with Cecily’s face reduced to a flesh-colored oval without eyes, nose, mouth, or ears. Presented in court, however, these images were not displayed at their native resolution but read off a disc on a laptop and fed into a high-definition television, which upscales the low-resolution image to render on the 1920x1080 screen. If you think of a digital image as composed of a series of squared pixels, each assigned a specific color value, blowing that image up to 1080p would reveal huge amounts of empty space in between each pixel for which the camera recorded data. In order to not present an image that is mostly empty space, computers and televisions use an upscaling process that either duplicates the color value of pixels to fill in adjacent empty spaces, or use an algorithm to predict what the color value of the empty pixels should be based on a reading of the pixels surrounding the empty space. When people testify about their experience of an event, they typically admit to being unable to recall certain details, but when a digital image is used as testimony, it covers up its holes with invented data not actually present in the original file. Evidence is presented in a medium that literally inserts information that is not actually there, oftentimes overwriting details that would actually have been present if recorded in a higher resolution. A watch on a man’s wrist would become clearly visible in a 1080p image, but derived from a lower resolution image file, the specific color values that would have been used to distinguish the subtle brown of a watch band from the skin-tone surrounding it would be lost, making the arm appear bare. This is the reason Cecily’s face appears like an indistinct oval, and the black mass moving across her torso is conceivable as both a shadow and the long-sleeved arm of a cop. British neuropsychologist Richard Gregory has suggested that memory is responsible for as much as 90 percent of human vision—what we see in something is overwhelmingly determined by the experiences we’ve had leading up to an event. This can explain why when a police officer in the Bronx saw 18 year-old Ramarley Graham he saw a criminal and not a kid goofing off on the street. This gave him license to follow Graham into his apartment and kill him, as he interpreted Graham’s flight an implicit admission of guilt and not a logical response to suddenly being transformed into a target without cause. We see what we already know, and though we think our flourishing ecosystem of surveillance cameras will protect us from unjust victimization, they are proving to be as easily folded into the architecture of systemic prejudice that makes it suspicious to react to defensively or fearfully in police activity. Cecily’s case isn’t isolated but only the most visible example of a phenomenon that sweeps up tens of thousands of lives into the American prison system every year, using technology to exploit and deepen pre-existing biases instead of refute them. Cecily had the support of experienced lawyers, a month-long trial, a dedicated group of activists supporting her, and a steady array of press attention from the New York Times, the Guardian, Wall Street Journal, Village Voice, and many others. Yet the controls of what evidence would be admissible during trial were almost exclusively in favor of the prosecution, while the defense’s attempts to introduce evidence about Officer Bovell’s previous incidences of violence were severely limited, as was any evidence surrounding the wider context of the police actions in Zuccotti, including evidence that police had been grabbing or fondling women’s breasts to provoke reactions they could interpret as hostile. Anthropologist and activist David Graeber reported one of his friends had her breast grabbed by cops five separate times in one night during the same period as Cecily’s case. Once the trial was over and the jurors were allowed to look up the facts of the case outside of the limits imposed in court, 9 of the 12 wrote a joint letter to the judge expressing remorse for their decision and pleading for leniency in Cecily’s sentencing. The video was compelling evidence only in the extremely limited and prejudicial context of the trial, only when the things the jurors were asked to see in it were limited to their subconscious mistrust of Occupy Wall Street, and the barrage of insupportable claims made by the prosecution, supported by a judge who allowed testimony from the police claiming Cecily had faked her seizure. This judge also prevented the defense from showing full video of her 10-minute seizure, and prohibiting audio that captured dozens of witnesses screaming at the police to call an ambulance, because it would be prejudicial. Livestreaming and instant documentation of abuses proliferated during Occupy Wall Street and the global protests that came before and after, reached an ironic climax when the NYPD’s failed #MyNYPD hashtag turned into a roar of communal outrage. The default assumption in all of these stories is that the cop told the truth or had the right to become physical, and all evidence to counter that claim is treated as insubstantial or inadmissible. What remains is a network of participatory surveillance, which we assume can be used to shield us from the worst exploitations of the law, yet ends up only deepening pre-existing biases. As many have noted, for all of the livestreaming and documentation during the Occupy Wall Street protests, not a single police officer has been convicted of any violent crime, yet a young graduate student with no prior criminal history has now been swept up by virtue of a video so unclear she doesn’t even have a face in it, a mosaic of best guesses from a computer that has no idea what absent information is covered over with each duped pixel. Michael Thomsen is Complex&apos;s tech columnist. 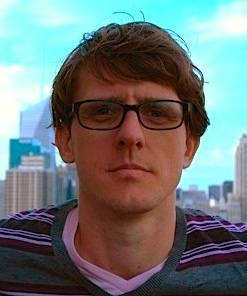 He has written for Slate, The Atlantic, Billboard, and is author of Levitate the Primate: Handjobs, Internet Dating, and Other Issues for Men. He tweets often at @mike_thomsen.